Jenn, The Leftover Queen. 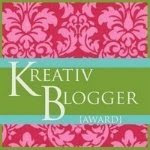 The Foodie Blogroll. The Royal Foodie Joust. This cupcake recipe. These four things are all connected. Jenn is not only The Leftover Queen, she's also the Queen of the Foodie Blogroll. 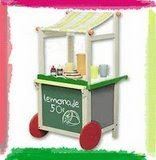 And every month on the blogroll forums, we have the Royal Foodie Joust. For each joust, three ingredients are chosen, and members that want to participate come up with dishes using them. This month's joust has a Caribbean theme, and the prize up for grabs is a Caribbean cookbook! 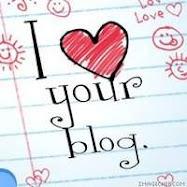 If you haven't joined the Foodie Blogroll, yet, what are you waiting for? The three ingredients for this month are rice, coconut, and bananas. I had quite a few ideas knocking around my head, but this is the one that came to be. 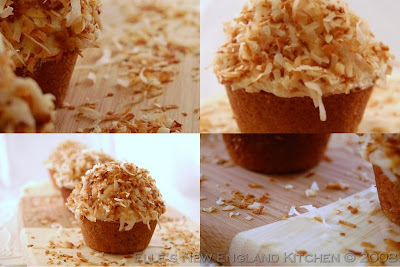 Banana cupcakes are great, but what about Bananas Foster Cupcakes? With mashed up Bananas Foster instead of plain old bananas? 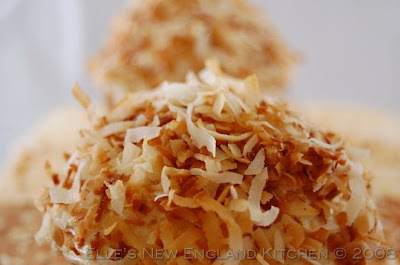 And oooh, buttercream frosting topped with toasted coconut? Yeah... And the rice shows up in the form of brown rice flour. Yep! I made Bananas Foster--first time ever. It was extremely easy, and so delicious. And yes, we took a couple of bites, then I mashed it all up for the cupcakes! Well, I did save the sauce. I wasn't sure what for, until I was making the buttercream. It was meant to be. Caramelized brown sugar, rum and spices--poured into the icing, along with a nice dose of salt. Perfect! 2. Beat together butter and both sugars until light and fluffy. 3. Beat in bananas, then eggs, one at a time and beat well after each addition. 5. Sift together flour, baking powder, soda and salt and add alternately with buttermilk to mixture. 7. Divide batter evenly among muffin cups. 8. Bake for 20 to 22 minutes or until tester comes out clean. 9. Let cool in pan for 5 minutes, then remove to a wire rack to cool completely. Isn't that cool? This was done under the supervision of Fire Marshall Bill, aka my husband. Melt butter in a 10-inch heavy skillet over low heat. Add water and bring sauce to simmer. Add bananas and cook for 1 minute on each side, carefully spooning sauce over bananas as they are cooking. Remove bananas from pan to a serving dish. Bring sauce to a simmer and carefully add the rum. If the sauce is very hot, the alcohol will flame on its own. If not, using stick flame, carefully ignite and continue cooking until flame dies out, approximately 1 to 2 minutes. If sauce is too thin, cook for 1 to 2 minutes until it is syrupy in consistency. Immediately spoon the sauce over bananas and serve. Or smash up to make cupcakes! The added salt in this really adds a nice touch and cuts the sweetness. In a standing mixer fitted with a whisk, mix together sugar and butter. Mix on low speed until well blended and then increase speed to medium and beat for another 3 minutes. Add vanilla and sauce and continue to beat on medium speed for 1 minute more. Make your Bananas Foster, bake your cupcakes, make the frosting, toast some coconut, and you're all set! These are really delicious. If you don't want to use the rice flour, go ahead and use whatever you prefer. 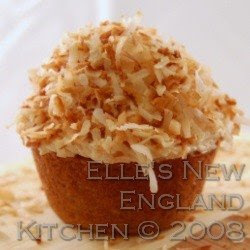 The cupcakes themselves aren't sweet at all, so the big old heaping pile of icing is very nice, not to mention the toasted coconut! And that's my entry for this month's Royal Foodie Joust. Check out my past winning recipe--it was my first joust ever, too! I'll take two please! I haven't even had breakfast yet, but I'm positive bananas are a suitable breakfast food and by association so are these lovely looking cupcakes. Wow, Elle. You make the Joust look so easy. I know that sometimes people have two of the three well executed, and then they struggle with the third ingredient. But the three ingredients just came together into a perfect little package for you. The cupcakes look truely sensational. Oh Elle, that frosting! You know how much I love Ms. Gand. That frosting is to die for! These came out beautifully. I love that one picture of the pan with the snow falling in it--check it out, so cool. What an incredible entry Elle!!! Those are absolutely beautiful!!! I used to make Bananas Foster quite often when I was catering parties. LOVE the stuff. Inside a cupcake? Well, you are quite genius. Hope you win! Your cupcakes look and sound scrumptious!! Good luck! I finally joined, yay, me! Looks awesome Elle! Good luck! OHHHH Pretty cupcakes, they look wonderful Elle! Amazing cupcakes! Look at the flames! These are super cute and look scrumptiously delicious! Awesome, that is totally over the top! Your family is very lucky! bananas foster is good. tossing those nanners into some cupcakes is, therefore, a stroke of genius. i'm smitten, elle--nicely done! Wow, so impressed, those look almost too god to eat! Ha! 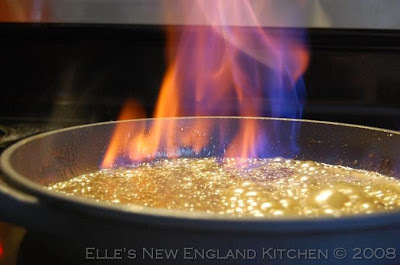 I've only made & tried Bananas Foster once, too -- for the flame show. It was worth it, but I'd have never been clever enough to turn mine into cupcakes. They look scrumptious! 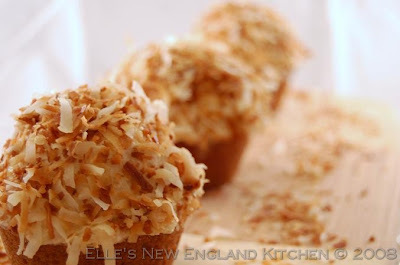 Oh, those look so delicious, Elle! Yum! Elle, I love Banana Foster and just looking at these make my want to run off to the kitchen to make them right now. These are beautiful! Happy new year to you and I hope that 2009 is your best year ever! It's been wonderful getting to know you! All hail the banana foster cupcake! Loved the pic of the flames on the sauce. WOW! I was tagged by onceinabluemoon, and now I'm tagging you. See my latest post for instructions. Thanks and happy new year! Very neat creation :). I like how you incorporated the brown rice flour. Happy New Year, hope you're staying warm...it's so cold here in MA! Good luck on the Joust, Elle! This one looks like a winner for sure! Congratulations on winning the Joust, Elle! Those cupcakes were one of my favorites! I just found your blog on the Leftover Queen and had to check out your recipe! This is another one of those occasions where I wish that my Laptop screen was "scratch-n-sniff". Those cupcakes look amazing! Beautiful cupcakes!! 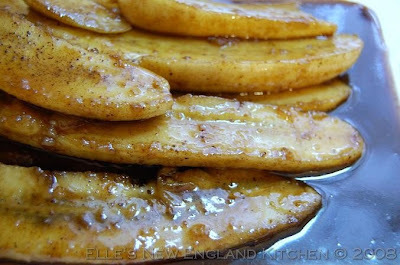 I love bananas foster, so I'm sure I'd love these! I ϳust like the helpful info you supply on your articles. right here! Goοԁ luck for the next! one of the most useful sites οn the web. I'm going to highly recommend this site!